Ornamental comb textured ceilings, fresh paint, custom stained hardwood floors, and big front windows create beautiful living and dining rooms. Fully fenced, with paved paths, sidewalk, planting strip, and a curb out front, this front yard is bright and open with garden beds hugging the covered porch. Craftsman lovers, we have another classic for you! From the covered front porch to custom finish on the oak floors, from ornamental ceilings to built-ins, this home is a beauty. Enjoy a circular floor plan, bright light pouring through the double-pane storm windows, quartz slab counters, full baths on 2 levels, and a fully fenced yard where fruit-bearing apple and pear trees will soon be ready to bloom. Downstairs, a live-in basement with separate access, a family room, laundry, full bath, and bedroom offers amazing flexibility. With a living and dining room as pretty as the ones in this home, you’ll appreciate having the additional living space in the cozy upstairs landing, or in the basement level for hobbies, toys, and other activities. That preserves the living room for comfort, for reading a book, gathering after meals, and hosting. 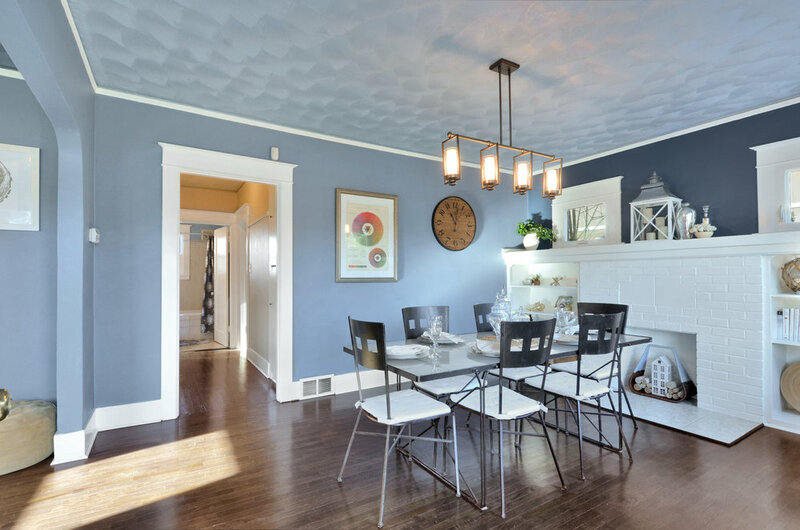 The dining room is lovely with its built-ins, hardwoods, and white mantel, but it doesn’t need to feel formal; it’s just right for everyday family meals or entertaining. The front and back yards provide even more room for branching out, especially in summer. There’s room to play, room to run, room to garden, room to grow. You’ll find this Craftsman just half a mile from the entrance to the Hilltop’s Business District, and 1 mile from downtown museums. That means you’re not far at all from cafes, community centers, coffee roasters, medical centers, parks, and culture of all kinds. We could go on, and we do, you’ll find a whole location section below to introduce you to the neighborhood, or just help you get to know it better. Continue on for the video tour, photos, Hilltop neighborhood highlights (including driving time and distance to a list of Tacoma favorites nearby), and many more details about this home. Open and bright with a white brick hearth, this dining room features an artistically textured ceiling, built-ins and those sweet windows that can open above the mantle. Ornamental comb textured ceilings, fresh paint, custom stained hardwood floors, and big front windows create beautiful living and dining rooms. Note: these windows are just nice looking, they’re also double-pane storm windows. Step right in. Well, pause on the front porch a moment if you’d like to, and then when you’re ready, the front rooms will be waiting. This living room and dining room are a warm welcome home. Turn left from the front door and you’re in the living room with its big east facing window, its hardwood floor, classic Craftsman trim, and a decorative comb-textured ceiling that lends elegance and interest. The living room opens into the dining room, as shown above, and is also just a few steps away from the kitchen. The living room includes classic wide trim, a large front window with panes that slide upward, refinished oak floors, and easy access to the kitchen. Enter the dining room from the front porch, and walk through to a hallway, or take a right into the cozy living room. Notice the convenient linen closet on the right in the hall. A beautiful dining room is often my favorite room in the house, at least my favorite room to look at, and this one does not disappoint. It shares the oak hardwoods found throughout the main floor with their distinguished custom dark stain, as well as the detail of the textured ceiling you saw in the living room (and will also find in the kitchen and bedroom on this level). The two tones of blue are calm without feeling cold, and contrast with the brightness of the built-in shelves, white brick hearth, and mantel. The home is heated by a gas furnace, so this hearth area is here for the charm and nostalgia it brings to the room. From the dining room, step into the hall leading to the bedroom, bathroom, and stairwells. You’ll notice a convenient linen closet on your right immediately upon entering into the hall. Hall closets might not be an exciting feature, but they’re so useful. Fill this one up with linens, or games, and the other odds and ends that inevitably find their way into our homes. A spacious kitchen with stainless appliances, fresh paint, bright light, and new quartz countertops. Coffee or tea with a view to the big back yard. Meals for two, or just a place to sit with cookbooks and plan meals, there are lots of ways to enjoy this space. Details like the decorative tile backsplash, quartz countertop, and ornamental comb textured ceiling, dress up this practical, well-appointed kitchen. The kitchen is spacious and bright, and - wonderfully - doesn’t dead-end, but instead fits into the circular flow of this main level. Brand new quartz slab counters gleam and compliment the tile backsplash. Stainless appliances, including a dishwasher, side-by-side refrigerator, stove, and microwave stay in the home, so you’ll be ready to fix a meal as soon as you unpack a few essentials. There’s even room in here for kitchen carts or a butcher’s block. Along with providing additional surface area for food preparation, they also add to the storage space, and vary the texture. Against the back wall of the kitchen, overlooking the back yard, there’s space for a little table where a cup of coffee may be enjoyed. It’s a place to sit and soak in the daylight, lay out the cookbooks to plan a meal, or perch for a quick breakfast on your way out for the day. Neutral colors, bright light, and a snug breakfast table for morning coffee create a warm, cozy atmosphere. Turn right just before the refrigerator for the hall where you'll find the bath and bedroom. A sunny little enclosed porch with a door into the kitchen and a door to the short flight of stairs leading to the back yard. Use it as mud room for boots and brooms, or keep it sweet as shown here. 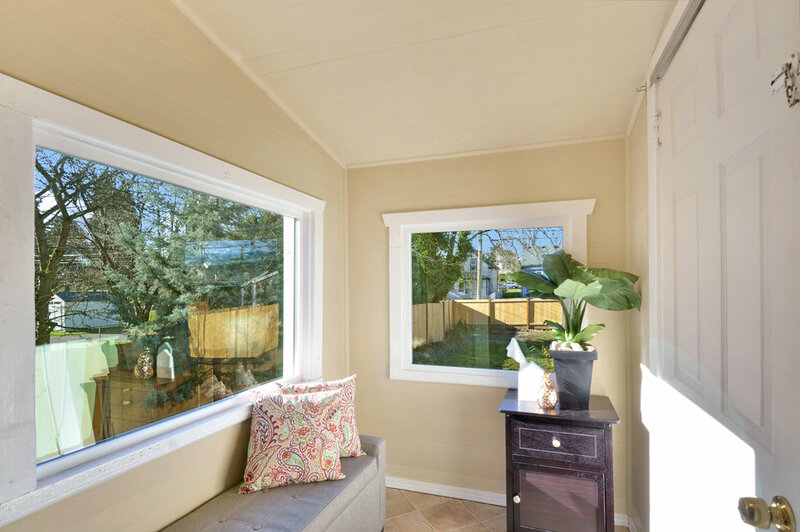 Directly off the kitchen, this enclosed porch provides a sunny spot to sit and take off your shoes after yard work, a corner to stash the broom and dustpan, a place your cat might like to lounge, a room where houseplants can enjoy some light. It’s also the access to the outdoors. Take a short flight of stairs down to the back yard and you’re out in the fresh air. The main floor bedroom with oak floors, the same beautifully textured ceiling, and windows to both the back and side yards. Calm colors, fresh paint, and classic details in the trim, floor, and ceiling create a very pretty bedroom. Remember that hall off the dining room, with the linen closet, the hall that connects to the kitchen too? That’s where you’ll find this bedroom with its windows to the back and side yards, fresh paint, oak floor, and convenient access to the full bathroom just outside the door. The soft gray walls should work nicely with bedding and decor of all kinds. Main floor full bath with tiled tub-shower combo is just outside the bedroom door, in a hallway accessed from the kitchen or living and dining area. This main floor offers a nice circular floor plan. Just outside the bedroom, this full bath with a jetted tub for spa-style soaking also features a vanity with a wide countertop and good storage space underneath. Add your favorite shower curtain and you’re all set. This bathroom is clean, bright, and ready to go. Upstairs bedroom with window facing north, perfect for a teen, roommate, guest, or even an independent kiddo. View from the bedroom side of the second floor, with a look across to the additional living space over on the south side of the stairwell. 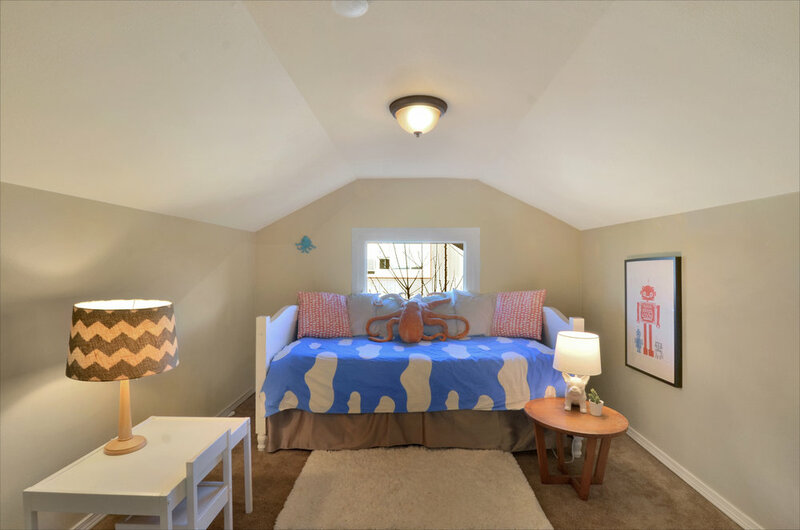 Upstairs, a bedroom perfect for a teen, a housemate, guest, or even an independent kiddo sits cozy under the sloped ceiling. Beyond the bedroom, there’s a flexible living space that can be used as you choose. Host the occasional guest here, set up a play room, work on homework, or just sit and look out the window. I’m guessing you have your own ideas! In the freshly painted second floor find a landing leading to one bedroom, with a flexible living space on the other side. Play room, music room, or even a spot to host the occasional guest. 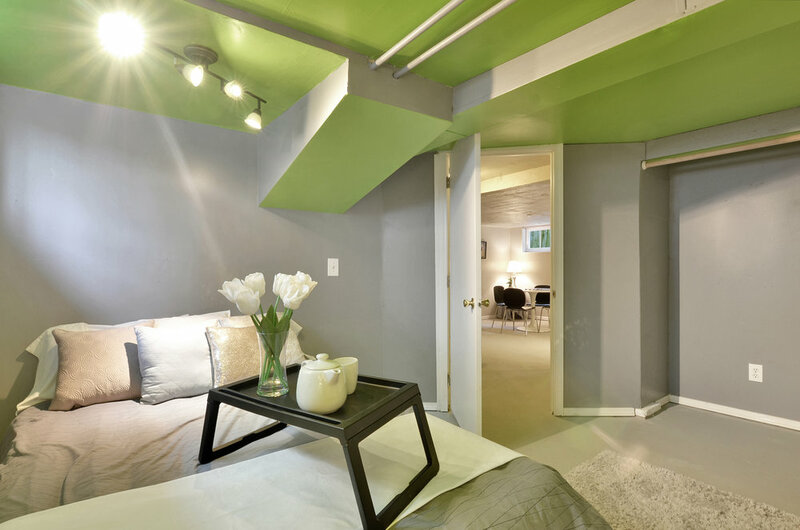 The freshly painted basement offers so much additional living space! Here, a family room, table for games, or homework, or meals is ready to let you spread out a bit, while keeping the beautiful front rooms looking tidy. Another view of the basement family room space with a glimpse into the bedroom beyond. Use this room as shown here, or set up a spot to exercise, a home office, or a big playroom with cozy area rugs. Take the stairs from the main floor hallway and you’re down in the basement with its own suite of rooms. Along with windows and fresh paint, overhead fixtures and lamps provide light. It feels fresh and open. There’s a family room with space for couches, tables, chairs, room for hobbies, for a home office, for exercise, or to spread out a project that won’t need to get cleared up in time for dinner. Another view of the downstairs bedroom, guest room, hobby room - you decide. A bedroom, full bathroom, and a laundry area with a utility sink complete the space. There’s even outdoor access from this level. 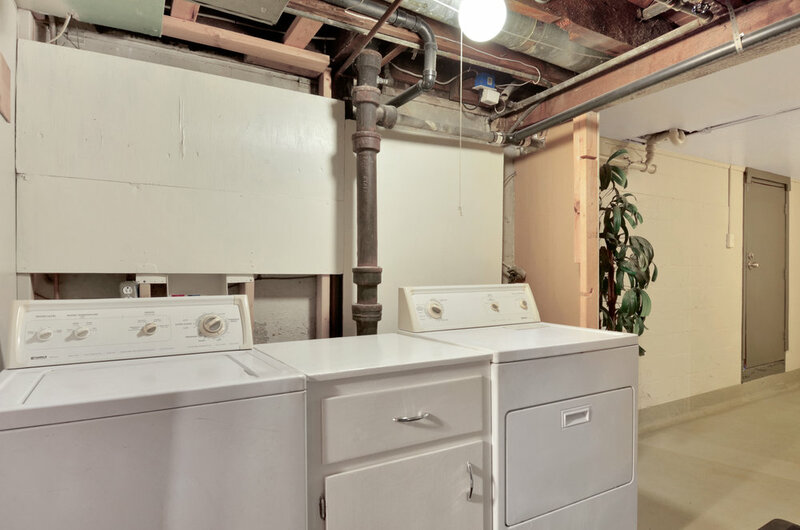 A separate entrance from the fenced back yard opens into an entry space by the laundry area. The full bath with its pedestal sink and combination shower/bath adds so much convenience to this level of the home, and keeps the one on the main floor from feeling too busy. It would be hard to overstate the flexibility and spaciousness this live-in basement adds to the home. This basement bedroom is warmed up with cozy rugs, and bright lights. The stairs up to the main level are just outside the bedroom door, and the 2nd full bathroom is close by! This 2nd full bath is located in the live-in basement. Shower-bath combo, tub surround, pedestal sink, fresh paint, all ready to go. The laundry area near the full bath, featured washer, dryer, and convenient cupboard. A utility sink is just around the corner. Just off the basement family room and near the laundry area, this door to the back yard creates a separate entrance, and convenient exit for this level of the home. An aluminum cover shields the back door into the basement living area, and a short flight of stairs leads up to the enclosed porch off the kitchen in this fully fenced back yard. Brand new fencing fully encloses the back yard with its lawn, trees, and so much room for running and playing, or gardening. It’s been a minute since you saw the front of this Craftsman; nice, isn’t it? Deep eaves, sturdy front porch, lots of windows, and those tidy paved paths that curve around the side to create shape and border the flower beds - it all lends some serious curb appeal. Speaking of the curb, there’s a paved sidewalk, planting strip, and a curb between the front yard and the street. The front yard is fully fenced, with a gate opening into the back yard. The back is also fully fenced, with brand new wooden fencing all the way around. There’s a lot of bright open space in this yard. It’s a yard all set for playing, but has plenty of room for raised beds, or flower patches. Some young evergreens grow along the borders, and you’ll notice a line of fruit-bearing trees on the north side of the fence. The fruit trees are young, but already produce Honeycrisp and Granny Smith apples, and D’anjou pears. Summer treats to look forward to. Notice the line of trees on the right in this west facing back yard. Those are fruit bearing apple and pear trees with Honeycrisp and Granny Smith apples, and D'anjou pears ripening in the summer. This yard is sunny, open, and fully fenced. A nice feature of this neighborhood is the paved sidewalks with the planting strip giving even more space between the front of the homes and the curb. Here you can see the front fence, as well as the side hedge, and get another look at the classic curb appeal of this Craftsman home. 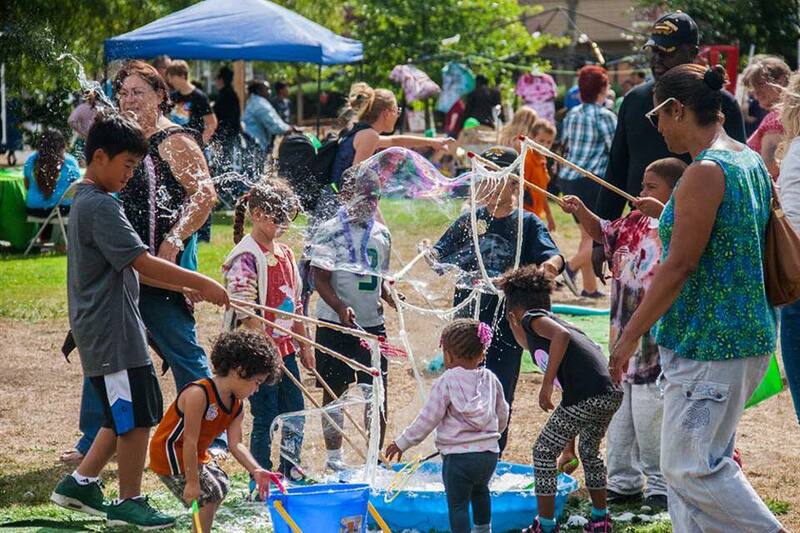 Image from Hilltop Action Coalition - get involved in your neighborhood! The heart of the Hilltop's business district stretches between S. 19th and S. 9th on MLK Way. 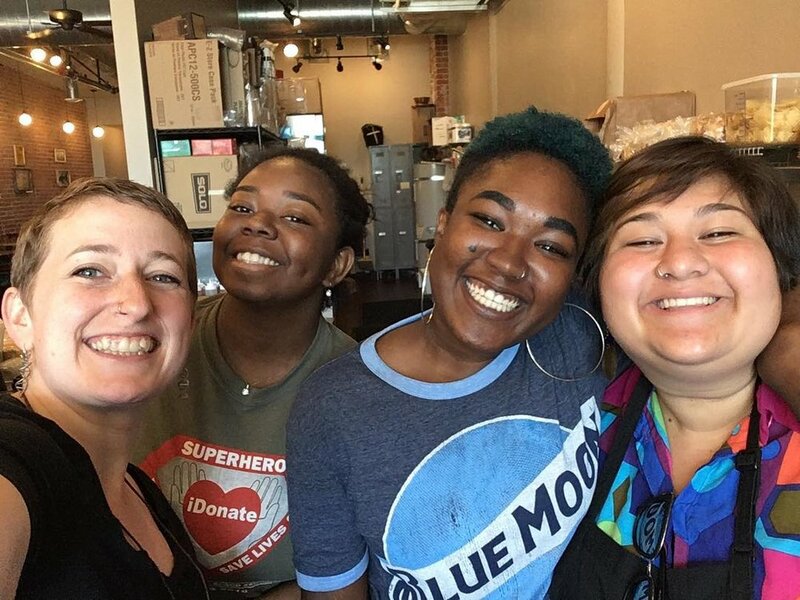 Favorites on MLK include The Fish House Cafe, a tiny blue restaurant serving fried fish and shrimp baskets for decades, Mr. Mac Ltd clothing store (opened in 1957 - read more about this Hilltop icon in this News Tribune article! ), Johnson's Candy Company (since 1949! ), Pho Bac and Pho King offering inexpensive Vietnamese food. Newer additions to the neighborhood like Red Elm Cafe, 2nd Cycle Community Cycle Center, and bars like The Eleven Eleven Bar, Zodiac Supper Club, and 1022 S J (craft cocktails and food too) indicate the ever-changing character of this area. Come see this Craftsman in person!